The Rolling Egg serves breakfast all day on the East Side. Eggs are rolling into Western-style breakfasts all day long on Tainan’s East Side. Bacon and eggs, omelets, scrambles, Eggs Benedict, pancakes, waffles, and steak breakfasts can be ordered off the menu from open to close. If breakfast food isn’t on your mind, their whole menu is available at any time (excluding the Age of Enlightenment). The lunch and dinner menu includes a variety of diner favorites such as soups, salads, sandwiches, pastas, nachos, and wings. They also have a wide variety of burgers including chili, guacamole, blue cheese, barbecue, and… peanut butter? Children sets are also on the menu, as are smoothies and milkshakes. The Eggs Benedict (left) and the Pancake Breakfast (right) are both served with juice and coffee. Rolling Egg sits just inside a lane off of Dongning Road that is right across from the park on the corner of Dongning and Linsen. Their decent-sized dining space is clean and comfortable with an open view of the kitchen and lots of daylight coming in through the glass facade. 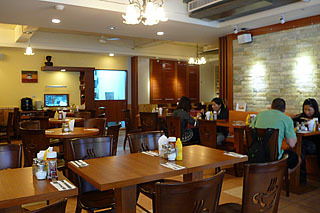 The place seems spacious on the weekdays, but expect crowds and possibly waits for brunch on the weekends. The service is good and some of the staff can accommodate English speakers. The dining room is clean and comfortable. 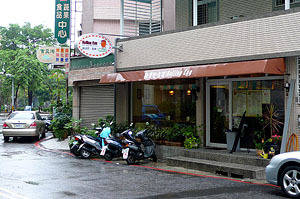 The menu has a great variety with clear descriptions in both English and Chinese. Prices for most plates range from NT180 – 280, but the portions are fairly large and the value is good. In general, I have been impressed with the quality of the food and its likeness to the diners I frequented back home. Good Eggs Benedict is something I miss a lot, and while their hollandaise was merely mediocre, it was a hundred times better than others I’ve tried in Taiwan. On whole, I would say Rolling Egg has the most authentic Western breakfast in the city. It is certainly a place worth seeking out if you want a good, hearty breakfast on a Sunday afternoon. Just ate here this morning due to your blog posting! Had a nice breakfast and will definitely return. Thanks for the information. The breakfasts are good and so are the burgers. As far as I’m concerned, it’s the best diner food in the city and maybe the country. Nice breakfast today, I am visiting my son in Tainan and stumbled upon this post so we tried it out. We both had omelets and they would have stood up to any in the USA. I am a chef and had restaurants in Hawaii so I have a little credibility on breakfast, my favorite meal. Will be back to try some other items before I depart. Had a nice conversation with the front of the house partner, who gave much credit to the chef. Both ladies seemed to care about their business. Is this place near any sightseeing location or anywhere worth visiting??? Unfortunately not. Well, I should say sort of. It’s nearby if you’re doing the Eastern Cultural Area tour. It’s about two short blocks from the Chang Jung Presbyterian Boy’s High School. If you have enough time to get to the lesser sites in the Eastern Cultural Area then it’s a great place to stop and eat. It’s also about a 20 minute walk from NCKU, but mostly it’s in a somewhat modern residential area. Your excellent site has made my visit to Tainan much more pleasant. Only one problem — the correct address for the Rolling Egg is Dong Ning Road, Lane 226, No. 33. The address listed in your website (which also appears on their business card) is the back door to the kitchen, where they accept deliveries, around the block from the customer entrance. Thanks for that information. I had just grabbed their address off their business card. I will make the change.